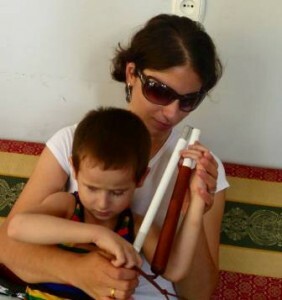 Child Family Society (CFS), an NGO based in Georgia working with and advocating for people with learning difficulties, is the workplace of FLEX alumna Mariam Mikiashvili ’05. There Mariam is the project manager for the USAID funded project, Reading for a Better Future, which finds and refers visually- and hearing- impaired children to schools, trains teachers, and works with parents to establish support groups and clubs. 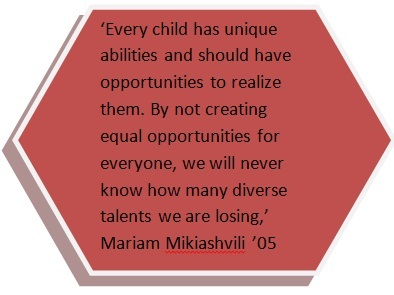 Mariam, who has a visual-impairment herself, is a role model for the young people that she works with. As project manager Mariam coordinates reading clubs for children with visual impairment, to encourage literacy among the students and their parents and teachers. 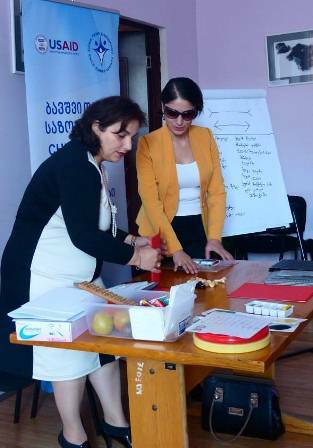 She also publishes methodological books for teachers and selects reading books for youth to be printed in Braille at the reading classes, which are conducted in Tbilisi and in eight other regions of the country. ‘Literacy skills are among some of the most important. Hopefully this project will offer education not only to children, but also to their teachers and parents – this will guarantee long-term development’. For Mariam, however, the most rewarding part of her job is finding children with visual or hearing impairment and connecting them with schools. Finding children in remote areas of the country is particularly challenging, since disability is exacerbated by gender prejudices; ‘Girls of ethnic minority backgrounds are especially hard to find. Some are hidden at home and don’t even have a disability status. They spend most of their time in isolation. Nobody teaches them. They often lack basic social skills’. Another part of Mariam’s job includes organizing awareness camps for children who are blind or partially-sighted and for their parents. The camps last one week and focus on developing basic academic, orientation and mobility skills and on providing training to parents. ‘The camps proved to be extremely successful. Parents realized that opportunities do exist for their children and the children grew more confident about their future. Many children had very limited social skills at the start of the camp and through the activities and facilitation, they began to learn how to communicate with the other children throughout the camp,’ she describes. Like many other FLEX students, during the year spent in the U.S. Mariam became more self-confident and began making decisions on her own. 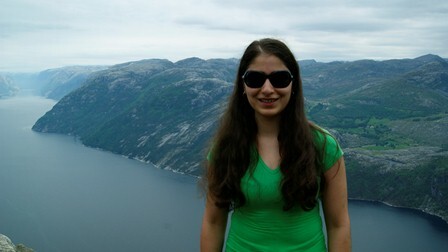 Mariam’s FLEX experience also allowed her to look at many things from a different perspective and taught her to appreciate her country more. This confidence led Mariam to launch her own NGO for visually-impaired children ‘Mariani’: ‘Founding Mariani had been my life dream.’ The next big project that the NGO will launch is the translation and publication of the book entitled, Helping Children Who Are Blind, since receiving funding for the project by the original publisher, the Hesperian Foundation. Mariam has big aspirations to open a rehabilitation centre for blind- and partially -sighted people to work to increase accessibility of public places and transportation, since this remains a huge problem in Georgia: ‘Teachers are not trained to help disabled students and there is only one specialized school in the entire country. All of the other schools lack basic equipment which makes it extremely difficult for visually-impaired children to study. An inaccessible environment hinders the independence of people with disabilities, which equates very often to the general public not taking the wishes, views, opinions, and abilities of people with disabilities into consideration’.